Optional if all fails: 1 TBSP gelatin diluted and soaked in 1/2 cup cold water for 5 minutes, heated up in the microwave before being added into the soup towards the end. Wash all the meats prior to adding them to the pot. Place Ox feet pieces in the crockpot. Place the beef snuggly into the pot, pour over the water so that the water covers the meat and has some extra on top, almost like 2-3 inches. With the amount of meat I have, I fill the water almost to the brims of my crock pot. Close the lid of the crock pot and turn the heat on low. Next step requires you to stick around a bit. After that, you can come back to it towards the end of cooking time. Once the meat starts boiling/simmering it is essential that you use a skimmer to get all the foam and unneeded fibers from the broth. I usually skim out the bottoms of the pot, too. You don’t have to be super thorough, because we will do this one more time towards the end. Close the lid again and let the broth simmer for about 5-6 hours. For me, the perfect time to cook meat in jelly is overnight. Once the time is up you have the beauty of a golden broth. Take out all the meat and bones from the pot and place them in a separate bowl. Using a big skimmer, pour the liquid gold into another pot. This time the pot will go on the cooktop. if you have some more meat on the bottom of the crockpot, you will be able to pick them out from the skimmer. Whatever else remains in the skimmer goes to trash. At the end of this process, you should have nice and clear (maybe not super clear) broth. Keep the broth ready until you prep all other ingredients. Separate the meat from the bones. Ox feet will have some big or small bones, inspect carefully. Once you have done that, cut the meat in smaller pieces. Chop up the garlic cloves. Turn on the heat under the broth to medium. Slowly add the meat. Follow it up with chopped garlic, salt, bay leaf, and black pepper. The salt content needs to be slightly higher to your taste. Just because when holodets is chilled, the sodium levels in it are not as profound. Once the broth starts simmering lower the heat a notch and let things simmer for about 6 minutes. Why not 5 or 10? I don’t know. That’s how my mother taught me, lol. The idea is not to overcook the garlic and give the bay leaf enough chance to infuse the broth with its flavor. NOTE: If you decided to use gelatin for jelling purposes, this would be a good time for you to incorporate it into the broth. Use the above method I described before adding gelatin. 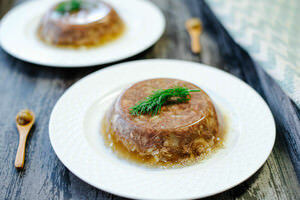 While the broth is getting simmered, ready the ramekins you will use in order to store holodets or meat in jelly. I usually keep things at 1 or 2 servings. You can definitely use larger dishes. For me, bigger dishes are usually impractical. When the time is up for the simmering of the broth, turn the heat off and move the pot next to the little bowls or ramekins you are using. Stir the pot well so that you have meat evenly distributed. Every time you pour this golden concoction into the designated bowls, do not forget to stir the pot a bit. Once you have evenly distributed everything evenly, let the jelly sit in the bowls for about an hour. Once the top has gotten a little harder or is covered in film, you can wrap the tops of the bowls with cling wrap and store them in the refrigerator. If you make the wrap tight enough, you can easily stack one bowl on top of another. This will save you some space in the fridge.